Stir in the remaining sugar, along with the flour, salt and 2 eggs. Mix on low speed until the dough forms and gathers around the paddle. Replace the paddle with the dough hook and add butter. Kneed on medium-high until the dough pulls away from the side of the bowl. Transfer dough to a large greased bowl and cover with plastic wrap. Let rest in a warm place until it doubles in size (about 1 hour). Divide the dough into 32 pieces and roll each piece into an 8-inch long rope. Lussekatter are a traditional Swedish treat. 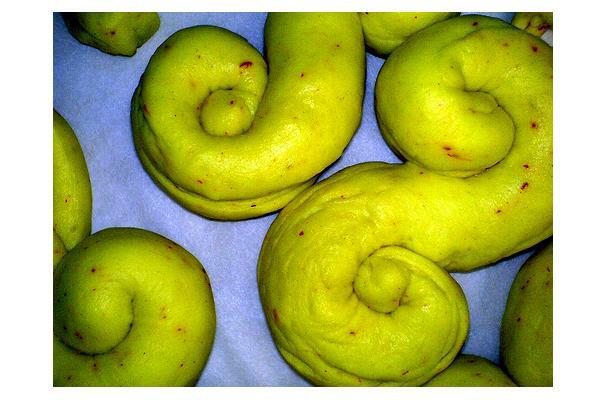 For best results, steep the saffron in hot milk before incorporating into the dough.